La Jolla was divided into several territories. You had the Shores, downtown La Jolla, Soladad, but none stand out better than Bird Rock. In the old days, living in Bird Rock, you were considered in the outskirts of La Jolla. Its boundary was west of La Jolla Mesa Drive, south to Turquoise and north to Via De Norta and east to the hill. 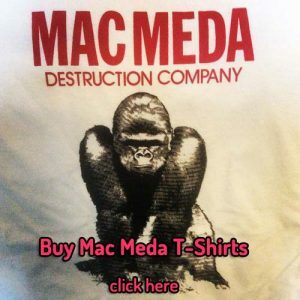 And to Mac Meda it was known for its two major watering holes Red Mountain Inn, and Sip n Surf, and to restaurants like Bullies and Ocean Fresh. It was also Jack McPherson’s mail route. Obviously it was named after the large rock that nested just about every sea gull and pelican in La Jolla. But Bird Rock got its claim to fame in La Jolla/Meda history because of its Hollywood-like-sign that was carved into the hill overlooking the ocean. 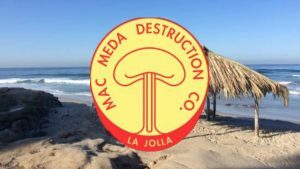 For years it was Bird Rocks identity, a symbol of the tiny community within La Jolla before developers, and community leaders thought it should be removed and censured forever. Don’t really know who built it or what year (maybe someone can share some light), but in the early days its upkeep was ongoing by local organization like the Boy Scouts and concerned volunteers who wanted Bird Rock to have its own character – a separation from church and state so to say. Weather and time play a major roll rearranging the white washed rocks and weeds and scrub brush was always being cleared out. And of course pranksters would alway rearranging the letters, and as the photo shows, a more appropriate description of the bird nesting rock that continues to this day looking more like a snow capped mountain. THE LAST SIGN ON THE HILL WAS “BIRDFUCK” AND SOMEONE DID NOT THINK IT WAS FUNNY. SO THEY REMOVED THE WHITE BIRD ROCKS. I like this photo because it shows the hill before all the big houses were built on top. Gary Wickham, Harry Marriner, Bob Atkinson, Ronnie Prast, John Warren and maybe a couple more Bird Rock teens started the Tiburones dive club in the late 1950’s. The club thought it would be cool to carve the club name on the side facing shore of Bird Rock. Local residents didn’t like the Spanish word for Sharks staring at them and quickly ground it out of the soft sandstone. The Bird Rock sign was made of white washed rocks. The picture shows the second time it was “rearranged”. The first time was on Halloween night in the early fifties when it was changed to read “Turd Rock”. Not sure when it was built, but I believe it was sometime in the late fourties. 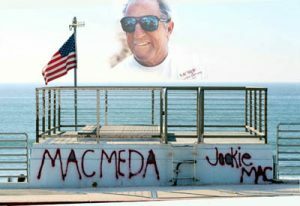 Yes Mac was the local mailman, he knew and was well liked by my entire family. By the way we bought Red Mountain Wine in gallons by the case (10-15 cases) from the Alpha Beta on Pearl St. it was the drink of choice at the early Conventions in Carmel Valley. Remember, back in those days a keg of beer cost $16 for 16 gallons. That’s 25 cents a quart! The Steins had enough money in the bank account to buy (and did buy) 19 kegs and I don’t think we had more than 19 members. I’ve seen a photo album Jon Sarrett has of “The Steins”. There are pictures from November 1964 to January 1965! According to his book, he was the first treasurer of the club and they had over $300 in the Bank of La Jolla. You forgot to mention Bird Rock Elementary. Home of “The Walrus, Craig Stadler of PGA fame. Home of Juanita Messick (Mac’s landlady and apparently ineffective grammar and spelling teacher). Bird Rock was also home to “The Steins” a hard drinking “Fraternity” of High School level party animals who held their parties at the Belleview Avenue house owned by the Bartletts (Steve [R.I.P. ], Tom [R.I.P] and Dave). LJHS class of ’68 tried to revive that club by organizing “Liquor Incorporated” [LI}. Drinking and planning reasons for Drinking their sole purpose. Many of these people are mentioned in the Meda ongoing saga. Good photo by Bill Decker. We look forward to more of your shots. Keep em coming!